British-born author Frances Hodgson Burnett is chiefly remembered for her book The Secret Garden (1911), one of the classics of children’s literature. Her biggest contemporary success, however, was Little Lord Fauntleroy (1886), though the story is now considered less significant for its literary merits than for its representation of the sentimental Victorian ideal of childhood. Although Burnett wrote for the adult marketplace at least as much as for the juvenile, her reputation rests firmly on her achievements as a children’s writer. Difficult Childhood in England. Born Frances Eliza Hodgson on November 24, 1849, in Manchester, England, she was the third of five children of Edwin Hodgson and Eliza Boond Hodgson. Her father operated a furniture store in the city, a center of Britain’s Industial Revolution in the late eighteenth and early nineteenth centuries. He died when Frances was four years old. Her mother tried to maintain the family store, but by 1865, Manchester’s economy, which depended primarily on textiles, had become undone by the interruption of cotton imports from the United States during the American Civil War. During that war, the Union navy blockaded the southern states and prevented them from exporting their main cash crop: cotton. The Hodgsons were devasted financially. Looking for a better life, the family immigrated to the United States and settled near Knoxville, Tennessee, where Frances’s uncle lived. In her mid-teens, Frances began publishing stories in women’s magazines to help support her family. Such publications offered women writers a chance to publish at a time when it was difficult for them to establish literary careers. Throughout the remainder of the 1860s, such was her popularity that she was published in nearly every popular American magazine. In 1871, Burnett was first published in a more overtly literary publication, Scribner’s Monthly, and, in 1873, her first novel, Dolly: A Love Story (also known as Vagabondia), was serialized. The family became increasingly dependent on Frances’s income following her mother’s death in 1872. Marriage and Writing Success. In the early 1870s, Frances visited England for a year. Upon returning to the United States in 1873, she married a Tennessee doctor, Swan Burnett, and the next year—after Burnett gave birth to Lionel, the first of their two children—the family moved to Paris, where Burnett’s husband pursued his interest in ophthalmology. Burnett continued to publish in American magazines as a secondary means of income for her family. In 1876, after Burnett gave birth to her second son, Vivian, the family returned to the United States and settled in Washington, D.C., where Burnett’s husband established a medical practice. Throughout the remainder of the 1870s as the United States recovered from the Civil War, Burnett published several realist novels, including the previously serialized works Dolly and That Lass o’ Lowrie’s (1877), which took place in a British mining community. Perhaps the most artistically successful of these novels is Through One Administration (1881), in which an unhappily married woman finds herself frustrated by conventions and expectations while circulating among high society in Washington, D.C. Increased Popularity with Children’s Stories. In 1879, Burnett also began publishing children’s stories. Her first major success in this genre came with the publication of Little Lord Fauntleroy (1886). This book concerns a little boy, Cedric Fauntleroy, who is guided by his seemingly infallible sense of fair play. Burnett’s novel became a runaway best seller in both England and the United States. It was translated into twelve languages and sold more than a million copies in English. Its success enabled Burnett to live independent of her husband, for their marriage had long been unhappy. However, its success also branded Burnett as a popular and romantic writer rather than a serious novelist. While on vacation abroad in 1887, Burnett discovered that E. V. Seebohm had written an unauthorized theatrical version of Little Lord Fauntleroy. (International copyright was effectively nonexistent in the nineteenth century.) Little Lord Fauntleroy was a major source of income for Burnett, and though Seebohm offered a half share of the profits if she would authorize his version, Burnett instead wrote her own adaptation. Sensation as a Playwright. Seebohm’s play went into production in London in February 1888; Burnett’s did not open until May. In the meantime, she took legal action against her rival. The judicial verdict was in her favor and established a precedent effectively forbidding unauthorized dramatizations of an author’s work. Burnett’s victory was not only a legal one, however. When her The Real Little Lord Fauntleroy was performed, reviewers acknowledged its superiority to the ‘‘pseudo-Fauntleroy’’ of Seebohm, praising the artistry of Burnett’s dramatic writing. During the late 1880s and into the 1890s, she enjoyed considerable success as a playwright, producing, for the most part, theatrical versions of her own stories. In 1888, Burnett published another popular book for children, Sara Crewe; or, What Happened at Miss Min- chin’s, in which a young girl, the daughter of a supposedly rich businessman, falls into poverty after her father dies penniless. This story confirmed Burnett’s growing stature as a masterly writer of children’s literature. Personal Tragedy Inspires Life and Work. But Burnett’s personal life became increasingly unhappy. She had separated from her husband, and her fifteen- year-old son, Lionel, fell ill with tuberculosis, then a common but usually fatal disease of the lungs. During most of 1890, Burnett traveled throughout Europe with her son, hoping in vain to find a treatment center that would cure him. Lionel died in Paris on December 7, 1890. Following Lionel’s death, Burnett threw herself into work for several children’s charities, which made her more aware of the harsh fate of poor children in London. She also published two collections of stories—Giovanni and the Other (1892) and Piccino, and Other Child Stories (1895)—both of which featured many stories about dead or dying children, inspired by her grief over the loss of her son. Between these two books, Burnett published her childhood memoir, The One I Knew the Best of All: A Memory of the Mind of a Child (1893). Originally intended to be a brief sketch, it developed into a work for adults. Its comments upon Burnett’s idea of childhood, and her memory of her own childhood psychology is illuminating for a study of her children’s fiction. The memoir also emphasizes Burnett’s lifelong obsession with gardens and the natural world. Critically Dismissed Adult Fiction. In the mid-1890s, Burnett resumed writing adult fiction, producing successful historical ‘‘costume dramas,’’ such as A Lady of Quality (1896), In Connection with the De Willoughby Claim (1899), The Making of a Marchioness (1901), and The Methods of Lady Walderhurst (1901). The popular success of these works sealed Burnett’s fate with the critics, who viewed her as a writer of third-rate potboilers who was no longer interested in attempting the serious social-realist mode that had earned praise in her early novels. 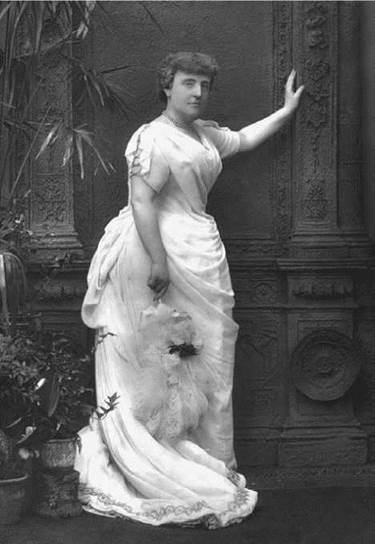 In 1898, Burnett was divorced from her husband. Two years later, she married her playwriting collaborator, Stephen Townesend. From the outset the marriage was a disaster, and the couple lived separately after 1902. Townesend died in 1914. A Little Princess and The Secret Garden. In 1905, Burnett became a naturalized U.S. citizen. That year also saw the publication of A Little Princess, a reworking of her story Sara Crewe. In this story, a young girl, reduced to poverty, uses the power of her imagination to transform her reality. A Little Princess won widespread favor, and it remains one of Burnett’s most popular works. Perhaps Burnett’s most acclaimed work for children is The Secret Garden (1911), which has the rejuvenating nature of gardening as a theme and celebrates the power of imagination. With its vivid, convincing depiction of life—particularly childhood—The Secret Garden is widely considered Burnett’s greatest work and a major contribution to the canon of children’s literature. While continuing to publish both children’s books such as The Little Hunchback Zia (1916) and a number of critically dismissed adult novels such as The Head of the House of Coombe (1922) and its sequel Robin (1922), Burnett lived comfortably at her home on Long Island, New York. She died there in 1924. Louisa May Alcott (1832-1888): American novelist and abolitionist; best known for her novel Little Women. Crazy Horse (c. 1842-1877): Lakota Indian warrior; fought against U.S. general George Custer in the Great Sioux War in 1876-1877, ending in Crazy Horse's surrender and death. Archduke Franz Ferdinand of Austria (1863-1914): Heir to the Austro-Hungarian throne; assassinated with his wife in Serbia in 1914, which led to the start of World War I.
Thomas Lipton (1848-1931): Scottish grocer and entrepreneur; bought tea plantations in India and established the Lipton tea brand. Guy de Maupassant (1850-1893): French novelist and writer; considered one of the creators of the modern short story. Children's literature is a vast genre and includes many titles originally written for adults. Here are some classic works of ''children's'' literature. Anne of Green Gables (1908), a novel by Lucy Maud Montgomery. A spunky adopted girl grows up and thrives in a farming community in rural Nova Scotia, Canada. The Lion, the Witch, and the Wardrobe (1950), a novel by C. S. Lewis. The first novel in the Chronicles of Narnia series introduces the land of Narnia, ruled by the evil White Witch whom four human children must defeat to save the Narnia. The Little Prince (1943), a novel by Antoine de Saint-Exupery. This fable of an isolated prince who learns what love means was written by a French aviator who disappeared while flying over enemy territory during World War II. The Once and Future King (1958), a novel by T. H. White. This story tells of the childhood and life of King Arthur and his betrayal by his favorite knight, Sir Lancelot. Treasure Island (1883), a novel by Robert Louis Stevenson. This adventure story featuring pirates and buried treasure is based on actual facts. According to her autobiography, Burnett’s imagination was stimulated by stories of adventure and romance she read as a child, such as ballads, biblical tales, and Roman histories. She was also influenced by the works of William Shakespeare, the Romantic poets, and novelists including Sir Walter Scott, James Fenimore Cooper, Mayne Reid, and Harrison Ainsworth. Nature in Burnett’s Work. Like the English poet William Wordsworth, Burnett depicts nature as the great teacher of children, nurturing spiritual and emotional health. She described her own bliss in the gardens of her childhood and her feelings of entrapment in the crowded and lifeless environment of a large manufacturing city. In contrast, she recounts the flowering of her emotions and the liberation of her spirit in the wilderness of rural Tennessee. If the house is a place of masculine rule, the garden is a place of maternal fertility and rebirth. The strong symbolic structures of The Secret Garden account for much of its emotional power as a narrative. The pattern of fall and redemption is associated with the biblical Fall of humankind. The locked garden is a version of the Garden of Eden, representing a lost paradise of love and idyllic happiness. In the tradition of medieval romance, the walled garden (often a rose garden) symbolized love, female sexuality, and fertility. The secret garden was initially a garden of love, and it symbolically remains a feminine place, the place of the maternal spirit, to which females bring males to find healing. Phyllis Bixler notes that Burnett’s use of fairy tale and fantasy and her romantic idealization of the child are in harmony with a contemporary movement in children’s fiction, seen, for example, in the work of Lewis Carroll and George MacDonald. Critical opinions about Burnett’s adult fiction have labeled her as a second-rate ‘‘relic of Victorianism,’’ increasingly irrelevant to a generation of readers in tune with twentieth-century modernism. However, her reputation as a children’s writer remains undiminished—The Secret Garden, in particular, is praised as a classic of the golden age of British children’s literature. 1. Studies show that being connected to the natural world can relieve stress and help concentration. How often are you outside for fun? What sorts of outside activities do you engage in on a regular basis? Write a brief essay describing one of these activities or an outside activity you would like to participate in, and how it contributes to your daily life. 2. Burnett went from being considered a ‘‘literary’’ writer to a ‘‘genre’’ writer, which is taken less seriously by literary critics. What do you think is the difference between ‘‘serious’’ fiction and popular fiction? Is one type necessarily better than the other? 3. Burnett emphasized the power of imagination in her books. What sorts of things do you think are important for children today to be aware of? Why? 4. Visit a local park, community garden, or botanical garden. Note how you feel before you go, during your time there, and afterward. Write a short essay describing the experience. 5. Do you think that imagination can help people transform their life? Write an essay arguing for or against this idea. If you disagree, what do you think is necessary instead? Bixler, Phyllis. Frances Hodgson Burnett. Boston: G. K. Hall, 1984. Brooke, Avery, and Madeleine L’Engle. Trailing Clouds of Glory: Spiritual Values in Children’s Books. Philadelphia: Westminster, 1985. Thwaite, Ann. Waiting for the Party: The Life of Frances Hodgson Burnett, 1849-1924. New York: Scribner, 1974. Wall, Barbara. The Narrator’s Voice: The Dilemma of Children’s Fiction. New York: St. Martin’s Press, 1991. Bixler, Phyllis. ‘‘The Oral-Formulaic Training of a Popular Fiction Writer: Frances Hodgson Burnett.’’ Journal of Popular Culture 15 (Spring 1982): 42-52. Gohlke, Madelon S. ‘‘Rereading The Secret Garden.’’ College English 41 (April 1980): 894-902. Keyser, Elizabeth Lennox. ‘‘‘Quite Contrary’: Frances Hodgson Burnett's The Secret Garden.'' Children’s Literature 11 (1983): 1-13. Molson, Francis J. ‘‘Frances Hodgson Burnett (1848-1924).’’ American Literary Realism 8 (Winter 1975): 35-41.